For this recipe you can use one of these following fillings. Place the oil and chopped onions in a pan and sauté for 2-3 minutes on low-medium heat. Add the spinach, salt and cook for 4-6 minutes stirring occasionally. When it’s done, sprinkle with black pepper (optional). In a bowl mix the oil and water. Mix them with a whisk. Place one layer yufka over a clean table or over the counter. Spread half of the oil-water mixture evenly on the surface and carefully cover the yufka with the other layer. Cut it into four equal quarters and then again cut each quarter into 3 equal pieces. You will have 12 yufka triangles. Place 1-2 Tbsp of the filling on the wider sides and fold the ends and roll it up as seen in the picture. Grease an oven tray. Then, dip each piece first in the oil-water mixture and the bread crumbs. Make sure to cover each piece with bread crumbs. This will give the crunchiness. Arrange them all on the oven tray. Preheat the oven to 350 F (180 C) and bake for about 30-45 minutes, until they turn golden brown. Serve hot or warm. 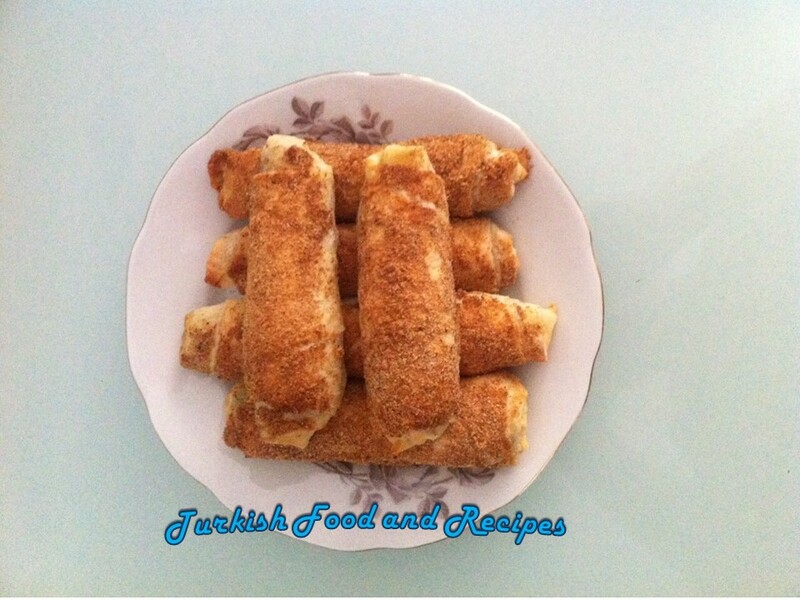 This recipe makes 12 pieces of crunchy borek. Bir tavada yag ve soganlari 2-3 dakika orta ateste kavurun. Ispanagi ve tuzu ilave edin ve ara sira karistirirak, 4-6 dakika pisirin. Hazir oldugu zaman uzerine karabiber serpin (istege bagli). Bir tencerede patatesleri haslayip, ezin. Bu sirada bir tavada sivi yag ile soganlari orta ateste 2-3 dakika boyunca kavurun. Sonra salcayi, tuzu ve patatesleri ilave edin. Karistirarak 4-5 dakika pisirin. Son olarak isterseniz karabiber ve kimyon ilave edin. Bir kasede su ve sivi yagini karistirin. Yufkanin bir tanesini genis bir yuzeye yayin ve su-sivi yag karisiminin yarisini yufkanin her yerine esit olarak yayin. Uzerine 2. yufkayi yayin ve yufkyi 4 esit parcaya kesin. Sonra her bir parcayi da esit 3’er parcaya kesin. Boylece toplam 12 tane ucgen yufka diliminiz olacak. Ic malzemeden 1-2 yemek kasigi alin ve ucgen yufkalarin genis kenarlarina yayin. Her iki kenarini da ice dogru katlayin ve uc kismina kadar yuvarlayarak rulo seklinde sarin. Firin tepsisini yaglayin. Her ruloyu geriye kalan su-siviyag karisimina batirin ve sonra da her tarafini galeta unu ile kaplayin. Galeta unu boreklerin citir citir olmasini saglayacaktir. Borekleri tepsiye aralikli olarak dizin. Onceden isitilmis 180 C (350 F) firinda, boreklerin uzeri kizarana dek, yaklasik 30-45 dakika pisirin. Sicak servis yapin. I very often cook this dish for my family, because it is great for snacks and is very useful for its composition. 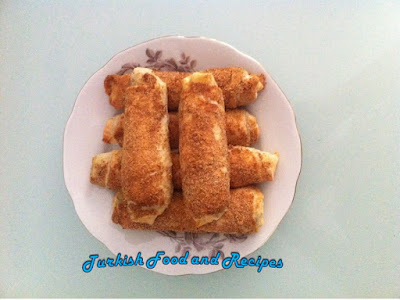 Your blog is very valuable to me so that you share with us simple and delicious recipes from ordinary products. In my opinion this recipe is worth trying, so thank you for sharing this i=one with us. I want to say thank you for your writing talent.